Minty, cooling menthol is naturally derived from mint plants. Camphor trees produce camphor oil. Menthol and camphor essential oils both belong to a class of chemical compounds known as terpenoids, and each has intense fragrance and a cool taste for medicinal uses or flavorings. Essential oil of eucalyptus is similarly used. The leaves, twigs or bark of the camphor tree and some eucalyptus trees give off a menthol-like odor when crushed. Mint is steam distilled to extract its essential oil, which is then dried and chilled to make crystallized menthol. The odor and flavor are the minty, cooling components of cough drops and creams. Menthol creams produce a cold sensation on the skin, and the vapor opens congested sinuses. Menthol works by binding to sensory neurons and sending a reduced temperature message to the brain. Menthol created synthetically from a process developed by Nobel Laureate Ryoji Noyri is chemically pure. Camphor trees (Cinnamomum camphora) are raised for timber and oils in China and Japan. They were introduced to Florida in 1875. The fragrant evergreen plants grow 25 to 40 high and are sold as ornamental landscape trees or large shrubs. Camphor trees displace native species and are considered invasive exotic plants in Florida. Camphor oil improves capillary circulation, and its vapors are therapeutically similar to menthol in treating upper respiratory congestion. Chemically synthesized turpentine compounds largely replace natural camphor oils. Eucalyptus trees produce essential oil of eucalyptus, a terpene compound, in varying concentrations. Oil is distilled from the foliage and used medicinally or as flavoring in cough drops, toothpaste and other products. Oil of eucalyptus is used for the synthesis of menthol. The crushed leaves of Nichol's willow-leafed peppermint eucalyptus smell like one source of menthol -- peppermint. Nichol's eucalyptus grows nearly 50 feet tall, with a gracefully weeping canopy, and is a suitable garden or street tree. 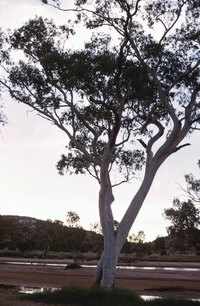 Australian blue gum (Eucalyptus globulus) is the primary source of medicinal eucalyptus oil, according to the University of Maryland Medical Center. The Tasmanian native tree grows 45 to 165 feet tall with a canopy spread of up to 75 feet. Commercial oil production is centered in subtropical regions including the Mediterranean, Morocco and Spain. The Australian blue gum is used as a windbreak. Its invasive roots, brittle wood and messy litter make even the compact form unsuitable for most home gardens.